In the final days of the current year, in which Iranian families are preparing to welcome the New Year*, a Baha’i couple, Payman Kooshakbaghi and Azita Rafizadeh were arrested and sent to prison to start their long sentences. There are four Baha’i couples among political prisoners and prisoners of conscience. This report is an attempt to introduce them and to bring to light how they are welcoming the New Year far from each other and from their children. On Sunday the 28th of February, Payman Kooshakbaghi, a Baha’i citizen, in the company of his son Basheer, went to Evin Prison to visit his wife. Before reaching the visiting room, he was arrested by three plain clothes officers and transferred to prison to start a five year sentence. Payman Kooshakbaghi, and his wife Azita Rafizadeh were arrested in June 2011 because they were working with and cooperating with the Baha’i Institute of Higher Education (BIHE). The couple, who studied in the same university after graduation in Computer Engineering, began to teach Baha’i students who had been denied an education online. Azita Rafizadeh went to India to continue her education; after she was successfully awarded Master’s Degree in Computer Science, she returned to Iran. In connection with the trial of these two Baha’is, a reliable source told Radio Zamaneh “Payman and Azita were summoned to the Revolutionary Court of Tehran, and were asked to sign a document stating that they would not work with BIHE any more. After doing so their case would be considered closed. On denying the request, Azita in June 2014 and Payman in May 2015, in the 28th branch of the Revolutionary Court under the presiding Judge Moghiseh, they were sentenced to four years and five years of imprisonment respectively. They were accused of membership in the “misguided” and illegal Baha’i group with the (supposed) aim of rising against the security of the country, and of being active in a Baha’i educational institution. After receiving her second summons, Azita, on 24 October 2015, presented herself to Evin prison to begin her four year sentence. 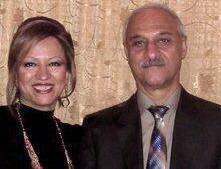 Another Baha’i couple who are in prison in Iran are Adel Naiemi and Elham Farahani. Naiemi was sentenced to 11 years, and his wife to four years of imprisonment. These two Baha’is are in Raja’i Shahr Prison and the women’s section of political prisoners and prisoners of conscience in Evin Prison respectively. Adel has endured more than three years and his wife more than two years of their sentences, while their son Shamim is enduring a sentence of three years with his father in the same prison. Iman Rashidi, Shabnam Mottahed, Fariborz Baghi and Nategheh Naiemi are other Baha’i couples who are behind bars in Yazd prison. 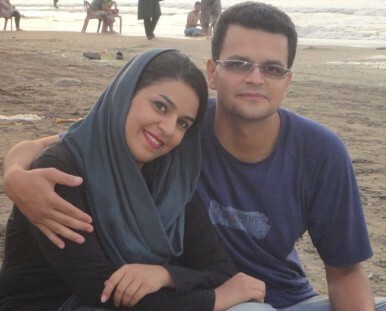 The imprisonment of these two couples is connected with the previous trial and sentencing of 20 Baha’i citizens in the city of Yazd. On 31 July 2012, twenty Baha’is were arrested collectively in the cities of Yazd, Kerman and Arak. After three weeks they were released on bail. In September 2013, the Islamic Revolutionary Court sentenced these Baha’i citizens to from one to four years of prison on charges of being members of secret (Baha’i) institutions and of rising against national security. From the month of February 2015, these convicted Baha’is ‒ including this couple ‒ were summoned one by one to assume their sentences. Iman Rashidi and his wife Shabnam Mottahed were summoned to Yazd prison on the 19th of March 2015 to undertake their sentences. The beginning of their sentences coincided with busy days of preparation for the Persian New Year, and thus has not been covered by any news media. 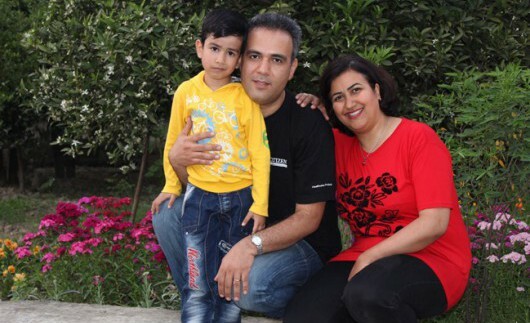 These two Baha’is have been in Yazd prison for more than eleven months. Iman has been sentenced to three and half years and Shabnam to two years of imprisonment. This young couple do not have any children. Fariborz Baghi is another Baha’i who was convicted by the Revolutionary Court of Yazd. He started his sentence on the 7th of March 2015. Fariborz was sentenced to two years imprisonment; his wife Nategheh Naiemi received a one year suspended sentence. The publication of this letter online and in social media did not show any effect on his sentence ‒ rather, it aggravated the conditions of Fariborz Baghi’s sentence. While he was still in prison the same Revolutionary Court added two more years to his sentence, accusing him of agitating public opinion. Fariborz’s wife, Nategheh Naiemi, after being summoned on 6th of October 2015 along with another Baha’i, A’zam Mottahari, they presented themselves to Yazd prison to complete their sentences. This couple have a son and a daughter. Leva, their daughter was married without her father being able to attend her wedding, as the Yazd prison authority refused to release him for few hours to attend his daughter’s wedding. * The Persian New Year is held on the vernal equinox.